Hyderabad April 22nd 2013: To mark the first Anniversary of Planet 21 (The sustainable development program launched by Accor Group last year) Novotel Hyderabad Convention Centre & HICC celebrated the occasion with their stakeholders and patrons and spread the message of energy conservation and resource optimization. As a part of the Anniversary celebrations NHCC employees and guests undertook environmental activities to protect and save the natural surroundings. Accor had undertaken this initiative to commemorate World Earth Day with the launch of Planet 21 in India last year. World Earth Day which was founded by United States Senator Gaylord Nelson is intended to inspire awareness and appreciation for our natural environment. Planet 21 celebrations which were started on April 20th 2013 involved team-based initiatives focusing on local green belt development, health and environment protection in Andhra Pradesh. As a part of the anniversary celebrations Novotel & HICC inaugurated a state of art first of its kind Sewage Treatment Plant (STP) at the property. 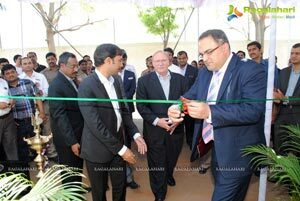 Mr. B. Madhusudhana Rao Joint Chief Environmental Engineer APPCB ( Andhra Pradesh Pollution Control Board ) inaugurated the project in the presence of Mr. Richard Hyde. British Dy. High Commissioner. The refurbished STP is designed to ensure maximum utility of treated water and conserve and save natural resources. The current STP was working with RBC technology (Rotating Biological Contact System) and the treated water was used only for gardening purpose. During the COP 11 conference the management decided to refurbish the Plant with FAB ( Fluidized Aerobic Bio Reactor ) technology for bringing in efficiency and reduce power consumption . Instead of using the conventional Epoxy coated Tanks the GFS (Glass Fused Steel) Tanks were preferred by the management for better efficiency and productivity of the plant. These GFS tanks have corrosion resistant finish and never needs to be re-coated. They come with premium vitreous enamel finish inside and outside. GFS tanks are resistant to atmospheric corrosion and UV light. They are high on durability and come with extended life usage. They are easy to maintain and can be cleaned without any difficulty, and are non-clogging. 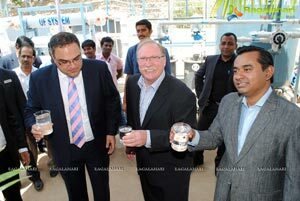 The FAB TANKS made out of GFS used in the Plant are imported from UK and will be used for the first time in the country. The UF Filtration system is can filter the treated water further to 0.1 microns and is PLC Controlled and is first of its kind in the state of Andhra Pradesh. Employees will be planting saplings at the STP area in the presence of key guests and dignitaries. NHCC also had hosted a special Green Brunch on 21st April 2013 with an environment friendly theme to celebrate Planet 21 anniversary. The entire menu for the brunch was prepared by using local produce and natural ingredients. The lobby was adorned with special pillars carrying the message of safe and secure environment. The guests were treated to an array of fun activities like special drawing competition, movie screening, puppet show and much more. To make it even more exciting each Kid had planted one tree in their own names and can adopt the sapling for life! 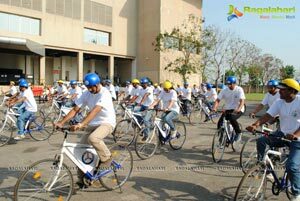 On April 22nd 2013 all non-essential lights will also be switched off at Novotel Hyderabad Convention Centre for an hour. This step is aimed not only to bring awareness about the growing concerns of global climate change but also demonstrate Accor Groups commitment to the environment. With this initiative NHCC wants to establish that how small, simple steps like turning off lights can help make a difference in protecting our communities for a sustainable future. 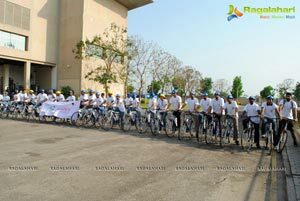 As a part of staff engagement at the property, the hotel is also organizing a cycle ride and lake cleaning activity for all the employees to participate and contribute towards this celebration. Novotel Hyderabad Convention Centre and Hyderabad International Convention Centre also encourage physically challenged persons by providing job opportunities in various departments and develop their skills as per their area of interest. NHCC & HICC has been associated with Swayamkrushi a voluntary organization dedicated towards the rehabilitation and integration of adults with developmental disabilities. The properties also work closely with Mother’s Nest (NGO) to give love and care for the aged and the destitute and support them by procuring food stuffs as an opportunity to create monetary benefits. Mercure Hyderabad Abids has been constantly working towards fight against epidemics & child protection. Accor has associated with Yashoda Hospital & Apollo Hospitals for creating awareness on Diet & Nutrition. Accor Andhra Pradesh is committed to make its mark by planning and implementing special initiatives as their contribution to Social & Economic Development for the region.